It was a beautiful sunny day in Quebec City, finally, after several days of grey, cold rain the sun was a welcome change on my last day visiting this delightful Northern city with a French flair. This morning I was strolling the cobblestone streets in search of a unique story that was distinctly Québécois. After a tour of the first jail in Quebec City and a chocolate factory full of history, I found myself in a quaint church courtyard cemetery. Cemeteries are a wealth of knowledge if you take the time to look. They tell you who the founding families are, when times were prosperous (number of births), or when times were tough (many deaths). There will be more time to talk about cemeteries later. This story is about JJ, who asked me what the heck I was doing cleaning off headstones and taking pictures. I hesitated for a moment, several nefarious scenarios running through my head. I was leery, to say the least. I imagined newspaper headlines, “American tourist disappears without a trace,” then I remember a story that Samantha Brown told at a conference I went to about how sometimes incredible stories happen at the oddest times – if you are open to them. So, with a deep swallow, I turned on my phone’s recorder and followed him. I was keenly aware of my surroundings as he led me through the wrought iron gate of the cemetery and down the street. We chatted, he told me about “this” building or “that” building giving little snippets of history. Pointing out different colors of bricks on the houses. The red ones are Canadian; the brown ones are English. The English would fill the bottom of their ships with the bricks to stabilize the boats. When they arrived in port, they would empty the bricks onto the beach. The townspeople would then collect them to build their houses. I was intrigued and amazed by the amount of history he knew about individual buildings in Faubourg Saint-Jean in Old Quebec City. We stopped outside of a two-story red brick building. Go inside JJ says, take your time. I walk through the door, not knowing what to expect, spread before me is one of the most beautiful grocery stores I have seen. When I walked through the door of J.A. Moisan, I feel as if I have passed through a door into another time period. Dark wood shelves with an aged honey sheen line the walls, filled with boxes and packages of unique food products that are not readily available at your local market. Woven baskets and artisan sausage hung from the ceiling. A refrigerator case along one wall held an assortment of fromages – cheese, from neighboring farms in the area. For a foodie this was a treat, I could have stayed for hours wandering the aisles looking and reading the packages, seeing the diversity of food, and wondering how much I could sample and what I could bring home with me to share with my husband – another foodie. Reluctant to leave, but elated and honored that JJ shared this corner of his neighborhood with me, I stepped out onto the sidewalk where JJ was waiting for me. JJ excitedly asks me what I thought. He then shared with me that J.A. Moisan first opened in 1871 and is the oldest continually running grocery store in North America. JJ speaks quickly, his sentences running together. He tells me that the store sat on “that corner across the street” until 1881 when a deadly fire burned through Faubourg Saint-Jean burning 800 buildings. Then the store moved to its current location. His excitement over sharing his city with a visitor is evident and infectious. Encouraged by my interest in learning about Quebec City’s off-the-beaten-path he declares, “I have a secret location to show you!” as he heads down the street waving with his hand for me to follow him once more. Thrilled with the last discovery, but still a bit leary, I follow as we zigzag across streets and into the lobby of a Hilton hotel. As we take the elevator up, I am thinking, this is so out of my norm, to follow a person I just met, either male or female, around a city I am visiting. What the heck am I doing? We step off the elevator into the gym. I take a side glance at JJ as we walk through and he talks to the attendant in French. The attendant waves us past. I think if this goes south there are people to hear me scream. As we head out the side exit of the gym, he grabs my hand and says, “shut your eyes.” Umm… say what?? He says, “it’s good, it’s good” as I look around at the people in the pool and the attendant. I mostly close my eyes as I let him lead me to the edge of the building and said open your eyes. There before me was a stunning unobstructed view of the city, from the port through the old town and fortifications all the way to the mountains. It was gorgeous. JJ pointed to some mountains on the horizon and says he has a cottage just over there. He has been in Quebec City for over 20 years. He points out a park down below us where kids are playing and people are walking their dogs. He tells me, that is an underground parking area. He remembers when they built it. It keeps the city beautiful, hides the many cars that come into the town each day, and gives people a place to enjoy nature. JJ also tells me about the city’s fortified walls and how the entrances had gates that would close every night. The gates were much smaller and the roads narrower at that time. Once the gates closed, no one could come in or out until the next morning. 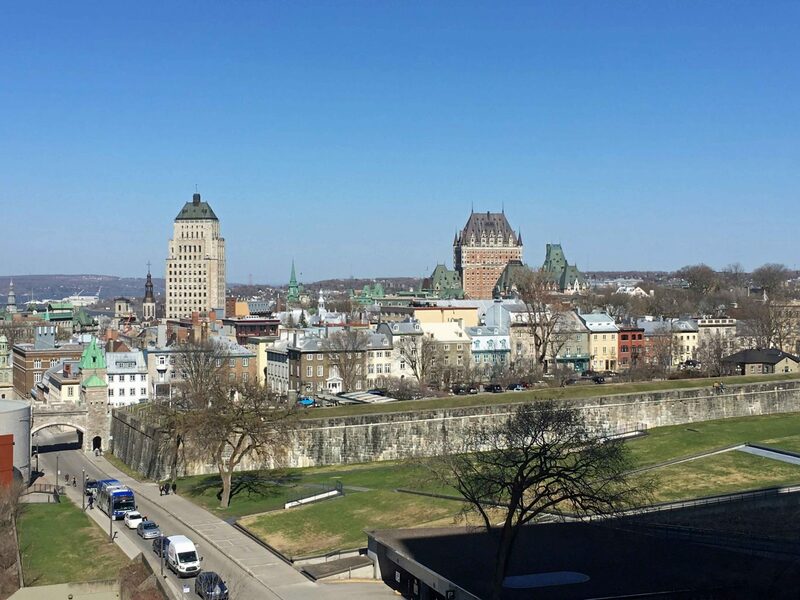 Again, I am amazed at JJ’s knowledge of Quebec City’s history and honored that he was willing to share his love of the city with me – to show me Quebec City through his eyes. He took the time to show me places that I did not know about and would not have otherwise seen. Through his kindness, I felt like I experienced part of what makes Quebec City a fantastic place – the people. I did not just show up, take a bunch of pictures, buy a souvenir and go home. I took a chance, stepped out of my comfort zone and was rewarded. What a lovely experience. Thanks for sharing it! It was a wonderful unexpected adventure! It taught me to be more open and that sometimes it is ok to talk to strangers.